When it comes to burgers, you can’t beat a diner that offers soft and succulent seitan patties. After attending the Vegan Connections Festival this year (you can see my blog post here), I decided I was going to stick around Glasgow for a bit longer to sample all their delightful vegan offerings. 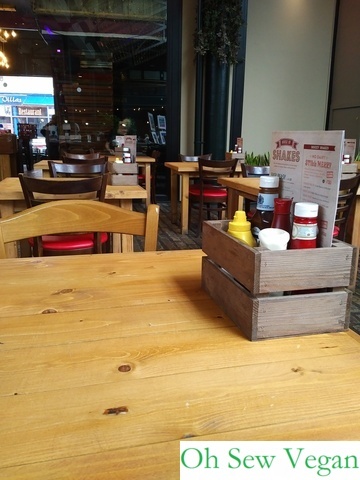 Having just been at The Briggait, I decided to visit American-style diner Steak, Cattle & Roll at Merchant Square, 10 minutes walk in either direction from The Briggait or George Square. There is also another diner at Sauchiehall Street, but as I was pressed for time before I had to catch the bus back to Edinburgh, the Merchant Square location was perfect for me. I’d never been to Merchant Square before, but was delighted to see rows of independent stalls set up within the ring of bars and restaurants that make up the exterior of the ground floor level shops. I was warmly greeted by a member of staff on arrival and promptly served a menu. The tables are quite well spaced out so you don’t feel like you’re joining in on the conversation at the next table. I decided to sit at one of the booth tables outside to enjoy the hustle and bustle of the square while I looked through some of the photos I took at the festival. The menu was clearly marked with vegan options (these are shown with ‘VG’ in a green circle next to each dish) and I was really spoilt for choice. 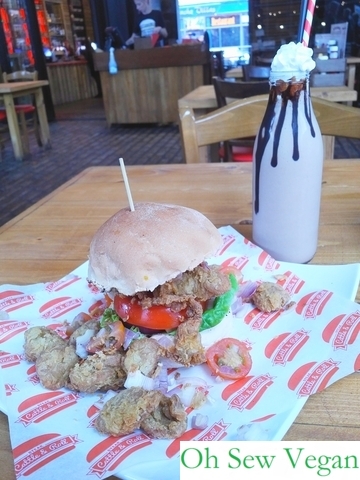 You can choose from a range of different burgers as well as vegan non-dairy milkshakes or choose a boozy vegan milkshake as well. Although not a fully vegan restaurant, it’s clear when placing my order with the waiting staff that they are well aware of (and used to) catering to vegan customers. 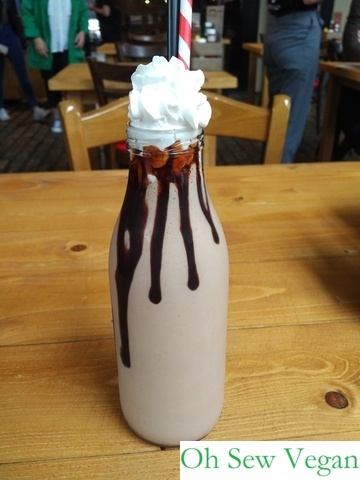 I wasn’t expecting much of a presentation with my chocolate and peanut butter vegan milkshake with hazelnut milk, but when it arrived, I felt like a little child being given their first milkshake. I can’t really explain what the attraction is, but I’ve always found chocolate to be a great accompaniment to my favourite nut spreads and ice cream. When I was in Italy for summer school many years ago, I used to order the stracciatella (vanilla with chocolate flakes or chips) and hazelnut gelato every day. Give me a scoop of chocolate ice cream drizzled with peanut butter and I’d happily devour the lot. Maybe it’s the idea that I got my chocolate ice cream, peanut butter and hazelnut milk all in one milk bottle, but I enjoyed every draw from the straw. I also wasn’t expecting the beautiful drizzle of chocolate sauce on the inside of the bottle which made a relatively plain chocolate milkshake look all the more exciting, don’t you agree? For many years before I became vegan, I hadn’t been too bothered about meat at all, but chicken was always my downfall. Finding out that seitan cooked the right way can provide vegans with a substitute was something I was very happy to find. 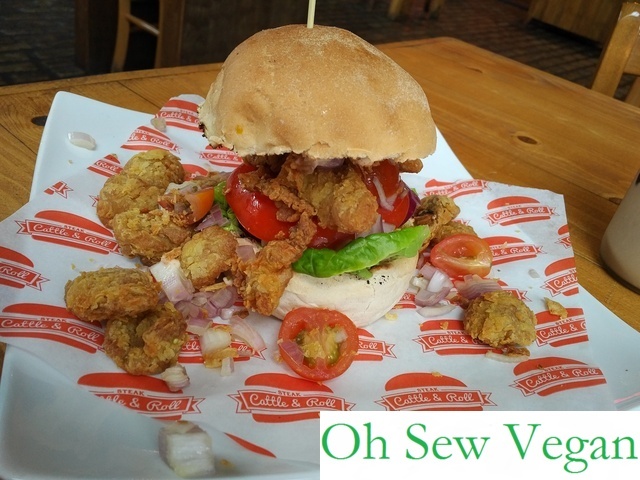 The southern fried Seitan tenders in mustard batter with cherry tomatoes, fresh shallots, crispy onion crumbs, cayenne mayo and classic garnish in the Vegan Chicken burger was the perfect combination of a sharp bite from raw onions with the tender sweet taste of their fried seitan tenders. My eyes must have popped out of my head when the waiting staff brought my burger to my table; I wasn’t quite expecting the burger to be as tall as it was! A more lady-like way to eat the burger probably would have been to cut it with a knife and fork, but I was game and eating alone, so I wasn’t afraid of making a mess. It also made eating this tender and delicious burger all the more worthwhile. The southern fried tenders were so good, it reminded me of popcorn chicken pieces and the bun was also nice and soft. My one bug bear is when you get a bun that is hard on the outside really difficult to bite into. I have no complaints whatsoever with Steak, Cattle & Roll’s vegan burgers. If they ever decide to sell their southern fried seitan tenders to supermarkets, you can guarantee I’ll be one of the first ones in line to stock up on them! 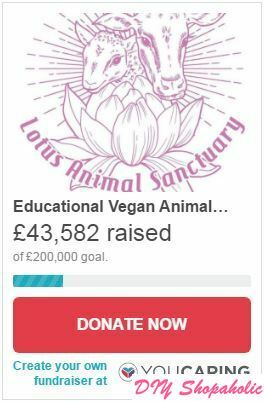 I would love to go back and sample some of their other vegan options, such as their BBQ southern fried vegan chicken salad or their vegan veggie wrap, and their sides – who wouldn’t be intrigued by the sound of Coca-Cola BBQ beans? Steak, Cattle & Roll can be found at 321 Sauchiehall Street, G2 3HW (contact number 0141 258 5220) or Merchant Square (17 Bell Street, G1 1NU – contact number 0141 258 6500). For more information and menus for both sites, visit their website here. What is your favourite dish from Steak, Cattle & Roll? it was so thick and tasty! would definitely recommend it!